Lightning 100 brings you our critically acclaimed weekly concert series featuring national, regional and local artists. 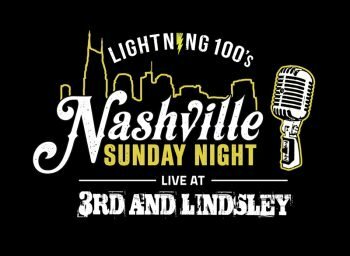 The show broadcasts live from 3rd & Lindsley on Sundays from 8-10 PM! Lightning 100 brings you our critically acclaimed weekly concert series featuring national, regional and local artists. The show broadcasts live from 3rd & Lindsley on Sundays from 8-10 PM. We are proud to say that Nashville Sunday Night is our longest running show and broadcast! Nashville Sunday Night is sponsored by New Amsterdam Vodka and Goose Island Beer. Missed last week's performace, check out our archived live broadcasts here! When: Every Sunday at 8:00pm (doors at 6:00pm) or catch the live broadcast at 8pm on Lightning 100 (100.1 FM)! Cost: Concert prices vary, purchase tickets HERE! Difficulty: This is a fun social event, check out the Team Lightning Group to find other friends who are going! Parking: Street and paid lot parking available! Check out the full concert calendar and purchase tickets here!